Shirts With Random Triangles: Jadeveon Clowney blames coaches for lackluster performance this season. Jadeveon Clowney blames coaches for lackluster performance this season. South Carolina defensive end Jadeveon Clowney's stock as the most feared player in college football has taking a severe drop over the first two game of the college football season. 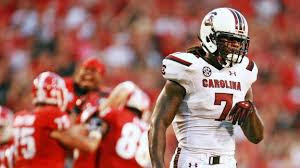 Lackluster performances against North Carolina and Georgia have begun to put into question of Clowney's being the number one overall pick in the 2014 NFL Draft. The pressure seems to be getting to Clowney, who suggested that his underperfromance so fer this season is the fault of his coaches, saying they aren't using him creatively enough. Speaking to reporters Clowney said "I told the coaches you got to put me somewhere else -- in the middle if you want to -- somewhere I can make some plays [to] help my team get in position to win. But [Georgia] took me right out of the game." Luckily for Clowney, South Carolina head football coach Steve Spurrier agrees with the fact that the defensive end hasn't been used as "creatively" as he should. "We've got to be a little more creative," Spurrier said. "We can't just sit there and never disguise and say, 'Come on.'"